Kabuli Pulao which is a famous specialty from its namesake Afghani capital. 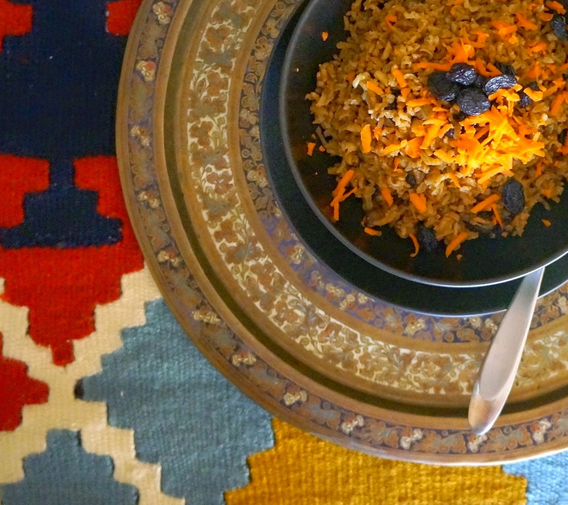 Afghani Rice is a colorful dish teeming with fragrant Eastern spices, traditionally made with lamb that is hidden between layers of long-grain rice and crowned with sweet carrots and raisins. I had this for the first time in Manhattan where I would spend summers with my grandmother, visiting her sister. I had forgotten all about it until recently when my parents treated us to a newfound eatery. Every bite took me back to those sunny days in New York City and had me anxious to make it myself. Afghan cuisine is more tame than spicy Indian food and subtle like to Persian food. Cooking basics are also surprisingly similar. Afghani Rice begins with meat cooked in boiling water, skimming the froth that forms on top. The precious broth is reserved for use in cooking the rice. While the meat is cooking, onions are sautéed, then a generous amount of garlic. Once everything is assembled into the pot, a clean tea towel wrapped around the lid collects the excess steam to ensure the rice stays fluffy. This is how Mom, like both my grandmothers before her, cooks and she has never been to Afghanistan. I have tried various recipes and this is my favourite because it is based on one from a home chef. There is something most unusual about it in that it incorporates a caramel, much like that used for creme caramel. I’ll admit I wasn’t too sure about this at first, but after I tasted the rice, I was convinced it was necessary. The garam masala is very simple, composed of only four ingredients. We have a $20 coffee grinder that we use only for grinding spices. I like toasting whole spices to bring out their oils before grinding them. Fresh bay leaves are especially fragrant. We have a small potted laurel plant on our back porch. So I don’t even buy dried bay leaves anymore. Typical of Middle Eastern dishes, Kabuli Pulao does take a bit of time to prepare. Beat the clock by preparing the meat and broth beforehand and even freezing some for future use. This dish is lovely with lamb, chicken or beef and, I dare say, possibly even shrimp. Do not let the long recipe instructions intimidate you. Read through the recipe once or twice so you get the idea. There is no special culinary experience necessary here, just a bit of patience and a hearty appetite. This is a dish well worth trying at home, especially because Afghan restaurants are a rare find. Who says you can’t have an exotic feast on a weeknight? put the lid on and cook over medium heat for 20 minutes. Skim the froth and discard the foam that forms over the broth. and toast for a few minutes over medium heat. Transfer to the grinder, add bay leaves and blitz to a powder. Set a pan over medium-high heat, drizzle olive oil into the pan. Chop onions and sauté until golden brown. Add garlic and fry another 2 minutes. Measure sugar into a small sauce pan and set onto medium heat. colour. Be careful as it tends to burn very quickly at this stage. the chicken broth and a generous pinch of salt. Bring to a boil, then reduce to a very low flame. Continue cooking another 10 minutes. Transfer to a bowl and cover with cold water until ready to use. Add rice to the chicken broth. Add sautéed onion and garlic, stir gently, put the lid on and bring to a boil. Once boiling, reduce heat and cook another 10 minutes. Add a dab of butter to the pan and set onto medium heat. Add carrots, raisins, a pinch of cardamom and a teaspoon of sugar. Stir and cook until carrots are glossy. Brown a couple of tablespoons of butter in a small pot. Be careful not to burn the butter. Remove lid from pot, gently transfer rice to a bowl and set aside. Return half of the rice to the pot over the potatoes. Pour hot sugar and spice broth over the chicken and rice. Tilt the carrots and raisins from the pan on top. Sprinkle another pinch of garam masala, cardamom and salt. Pour brown butter on top. To serve, lift the lid, gently remove carrots and raisins and set aside. Place a large serving platter over the pot. flip the pot onto the platter so that the potatoes are on top. Carefully lift the pot off of the rice. Garnish the top with the carrots and raisins. Serve with yogurt, fresh salad and Indian lime pickle. Finding beauty in everyday things, including necessities, is the secret to happiness. This is not to say that you’ll ever find me whistling a fine tune and dancing to the beat when folding the laundry. In fact, there is a mountain of laundry resting on top of our foosball table as we speak. Daisy is lucky to be too young to be expected to partake in the joy of this chore. Both Shawn and I will find every excuse to avoid it, like mowing the lawn or making complicated foreign dishes. Food shouldn’t just be for nourishment. It should also set the scene for relaxing in good company with a meal that delights the senses. Every sweet spoonful of cardamom-scented Afghani Rice will convince you of that, although paying attention to the conversation may prove a bit of a challenge. wow this looks seriously delicious, the colours look amazing.. love the recipe too, definitely one i will be saving! thanks for the inspiration! Hi Coco, what a nice story, love this dish and all the great spices used. Glad to see you here, Thalia. Love your dishes, too. Can't get that Kahlua gingerbread chocolate gig out of my mind. Cheri, it's such an interesting dish. Hope you give it a go. I am crazy about rice dishes.. this afghani pulao looks and sounds so delicious.. Can't wait to try!! The Kabuli Pulao is unique indeed. I would love to try this. Pinning it. I happened to make a pulao similar to what you described here (boiling meat and using broth to cook rice) which is called Yakhni Pulao. Lovely!!! Your description and pics sound/look amazing!! I honestly can't wait to make and eat this! such fantastic flavors and spices – LOVE it!